This looks good, or more to the point, Milla Jovovich looks good. Hehehehehe. All the girls look good. Glad we are continuing with them. September 14, 2012. It's a ways off. Hang in there. What the f u c k ! I just watched the Trailer again for the first time since I originally posted it and I just noticed Michelle Rodriguez. Clone!! The trailer looks really good and has me pumped to see this. The opening is very interesting. They are implying one of three things A) None of the movies that we have seen ever happened or B) This is an alternate reality or C) Everything is an implanted memory. I dunno which it is, but I can't wait to see this. I like that they are bringing back characters that didn't can't make it to the end of the race. Too bad they couldn't bring back everyone though. Some actors just think they are above making RE movies now. Bah!! Thanks for adding that. I saw that earlier and it slipped my mind. 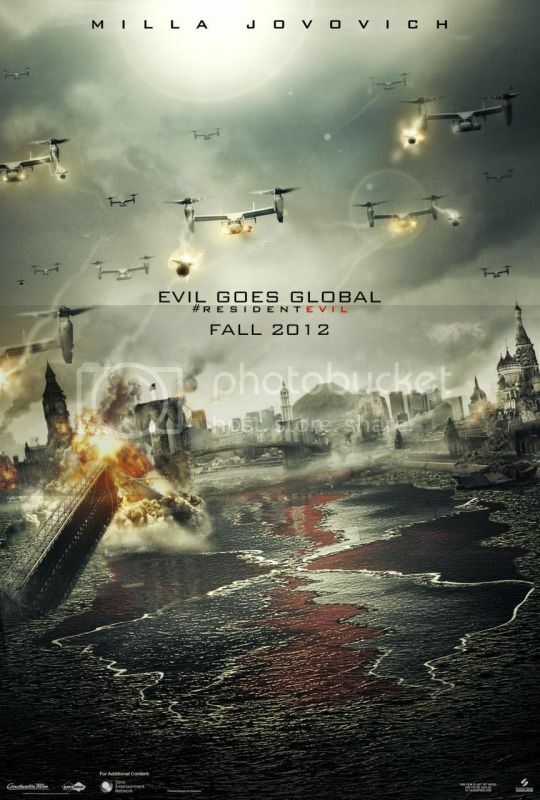 The poster says evil goes global. I thought it went global a couple of movies back? I noticed that when I put the poster up and thought the same thing. another still from Resident Evil: Retribution. You’ve seen a lot form this movie but you have yet to see a close-up of one of its zombies. Problem solved!